Models AS16 and AS56 are high precision sensors measuring turbidity (AS16-N and AS56-N) or color (AS16-F and AS56-F) for use in various industries. The sensors are designed for inline operation and provide accurate concentration measurements with remarkable repeatability, linearity and resolution. 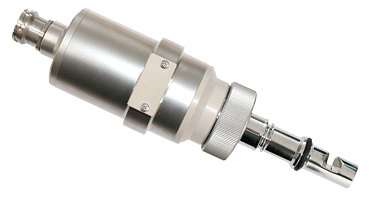 The AS16 series offers the high-end range of optek probe sensors. A wide selection of different optical path lengths and insertion depths combined with optional calibration filters and electro-polished stainless steel meet all requirements of the biotechnology industry. The AS56, based on the same design as the AS16 with seal-less window construction, is typically used in food and beverage applications. Limited variations allow cost effective measurement (e.g., phase separation). A special tungsten lamp produces a constant light beam that passes through the process medium. The attenuation of the light intensity, caused by absorption and/or scattering by dissolved and undissolved substances, is detected by a sealed silicon photodiode. The AS16-N and AS56-N uses light from 730 - 970 nm to measure solids concentration independent from color or color changes (e.g., yeast concentration in beer during tank draining). The AS16-F and AS56-F uses a specific wavelength in the visible spectrum to measure color in liquids with little or no turbidity (e.g., beer in water during phase change). Special optical windows are made from a single crystal sapphire, providing superior resistance to all abrasive and corrosive media. optek‘s superior manufacturing techniques allow mounting the windows without gaskets or glue for lifetime without maintenance. The appropriate choice of the optimal OPL (optical path length = distance between the windows) supports all measurement requirements, i.e., low/high measuring ranges at highest resolution. NIST-traceable calibration accessories (AS16 only) provide absolute measurement confidence.